This report deals with the duration of Sindh Assembly sessions held between November 18, 2011 to May 8, 2012, the attendance of members and maintenance of quorum [at least 1/4th (42 Members) of the total Membership]. The Sindh Assembly held 48 sittings during the reporting period and met for 110 hours and 46 minutes. The average time of each sitting was two hours and 18 minutes. 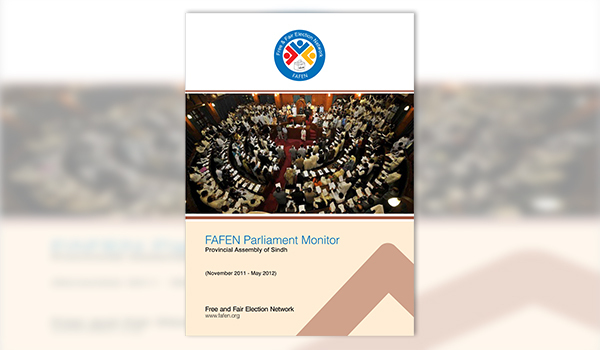 FAFEN monitors observed that the quorum was noticeably lacking in various sessions and was mostly not pointed out. The members may have deliberately refrained from pointing out the lack of quorum, which would have resulted in the suspension of assembly’s proceedings. None of the sittings started at the stipulated time. On average, each sitting started 77 minutes late. This report also reviews the presence of the Speaker, Deputy Speaker, Chief Minister and parliamentary leaders in the House the Sindh Assembly has no notified opposition benches. As the Sindh Assembly secretariat did not make public information on members’ attendance and the time they spent in the assembly, it is therefore difficult to ascertain how much time a member actually spent in the House. Members’ leave applications, however, did suggest that the majority of them remained present, at least technically, in most of the sittings. FAFEN conducts a headcount of members at the start and the end of each sitting. The Sindh Assembly passed 14 bills out of 24 that appeared on the agenda, achieving a legislation output rate of 58%. However, the House did not pass any private members’ bills.